Sam Bresnick had a phenomenal year on the pitcher's mound. 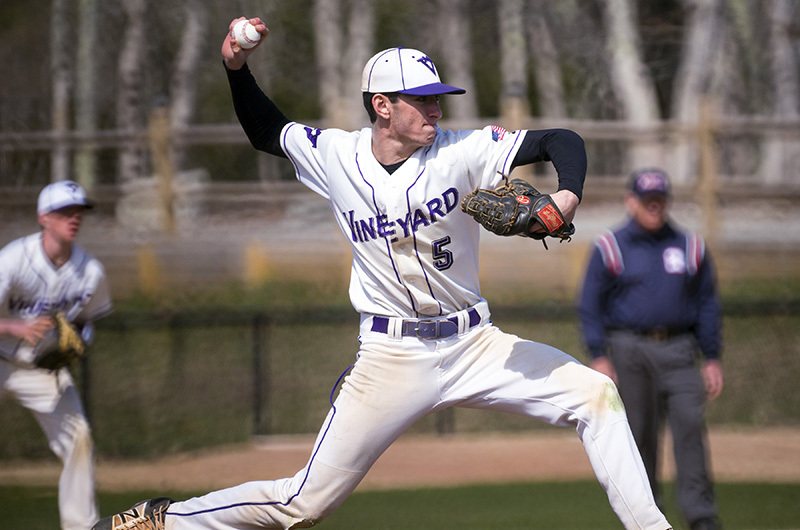 Martha’s Vineyard Regional High School baseball standout Sam Bresnick was selected to the Massachusetts State All Star Game. “Sam had a phenomenal year,” said Coach Gary Simmons. Although Sam had played shortstop in years past, Coach Simmons transitioned him to the pitcher’s mound, where he had one of the best statistical seasons in the state. In 55 innings, Bresnick struck out over 50 hitters and posted a 1.78 era. Bresnick will play for Orleans in the American Legion League on Cape Cod this summer, and then plans to attend Boston College in the fall. Coaches throughout the state nominate their best players as All Stars, and then a selection committee whittles down the choices from there. This year, the Vineyard will have two representatives at the game: Sam Bresnick and Coach Simmons himself. “This was the first year I was selected to coach the game. It’s awesome,” Coach Simmons said. The game will take place on Tuesday, June 19 at St. John’s High School in Shrewsbury. Boy oh boy. St John's in Shrewsbury has a lot going on Tuesday. All star baseball and the MV girl's tennis championship match . Good Luck All.